Accounting Software Philippines | Fasttrack Solutions Inc.
Why you should have an Accounting Software? Running a business means keeping track of your finances. This could be easy if the business is a small enterprise such as a mom-and-pop venture. If your business is big, or is growing, having the best accounting software is the only way to know where every peso and every centavo comes from. Or goes. Are you a company in the Philippines looking for an Accounting Software? An accounting software can seem to be the best thing that has happened to somebody who has been used to a manual way of recording and storing financial data. Manual does not mean keeping records using pen and paper. It could also mean having files recorded as computer files, as in a spreadsheet, but which are not linked to each other. In themselves, they do not tell a story. But when an accounting system software is used, the various phases of the business, called modules, are brought together and the information stored begins to paint a picture of how the business is doing. 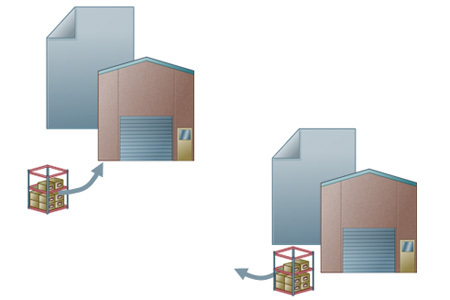 Examples of modules are accounts receivable, accounts payable, billing, inventory system module, sales order and bookkeeping. These make up the core operations of any enterprise. Sometimes, the accounting software is developed in-house, meaning it is designed by the organization using it so that it costs less and caters to the specific needs of that company. There is also the off-the-shelf accounting software. These are ones you buy from a store and use in your own facilities without any need for complex implementation. The features are generic and are applicable to many types of businesses across several industries. Finally, there is the accounting software that is bought from a provider and implemented in the company’s computers. This is the kind of accounting software that is most expensive. The brand is usually well-known and established, already used by many prominent businesses. And of course, having a top-of-the-line accounting software will be of no use if a company does not have the environment and the technological infrastructure to use it. This means that computers must meet a minimum requirement in terms of speed and capacity. Or else, no matter how fancy the accounting software is, it is not going to run or it will most definitely encounter problems. It will be useless. Sometimes, the cost of the implementation and infrastructure is greater than the actual cost of the accounting software. Note that companies generally pay not for the product itself, but for the license to use it. Such licenses have expiration dates and buyers need to renew their purchase after a certain period, or upgrade to the next versions in order to keep on using the accounting software. Finally, having an accounting software means also having people who have the technological know-how to use it, apply it to the company’s requirements, and interpret the data that is generated. Every business transaction is recorded in the company’s books. To report the business transactions to the authorities. A certain account increases value and another decreases value, resulting in the recording of balancing debit side and credit side postings. These are the documents in the sales process that create automatic journal entries and hence affect the accounting system: the delivery, the A/R invoice, the incoming payment and the deposit. The receivable and payable control accounts accumulate the customers and vendors transactions in their balances. 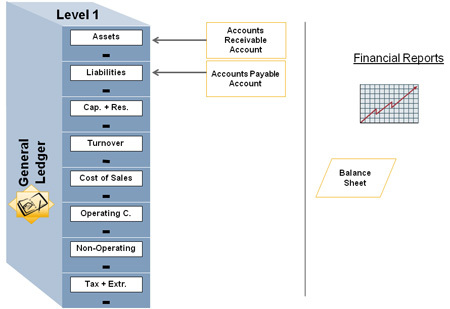 The Chart of Accounts presents the complete financial status of the company. You can use projects in SAP Business One to monitor your company’s larger key projects and their economic success. You can also enter projects in general ledger accounts or business partners. The Transaction Report by Projects lists all postings that you have made for a selected project. 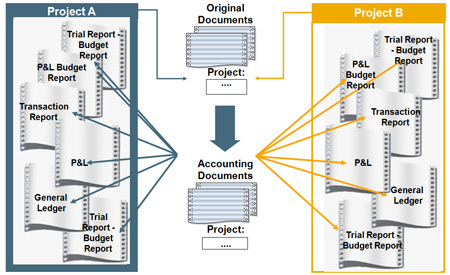 You can produce many standard reports for a specific project, for example, Profit and Loss Statement, Trial Balance, and Budget Report. 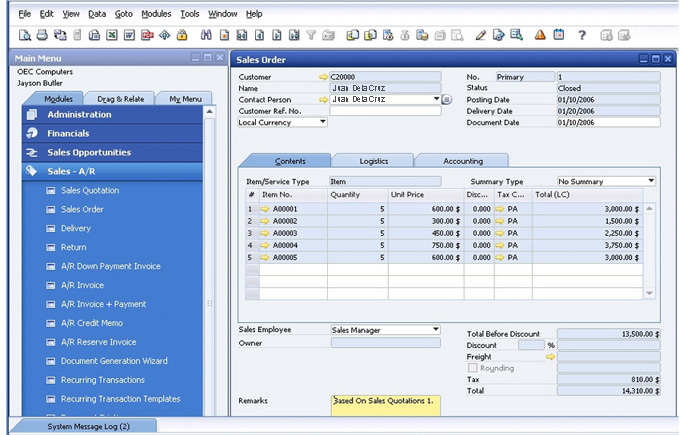 Looking for Accounting Software Philippines? For a better understanding of our accounting software we could set a meeting for you to see its core features. A demo will let you see the accounting software in action so you could assess its critical features, pricing and the system's ease of use.